Go old-school fun with this classic game. Materials: Bubble solution – lots of it – and bubble wands of all sorts. What to Do: Create a sea of bubbles around your child by blowing them all over the place. 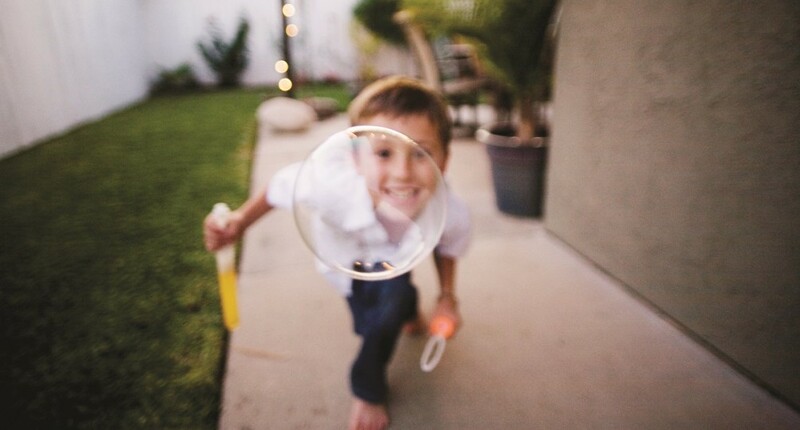 Encourage your child to “catch” a bubble or count how many bubbles he can pop. Hint: If weather permits, take it outside so you don’t have to worry about any bubble residue in your house. For additional fun, consider using a bubble machine. Variation: Kids often have a hard time getting the hang of how to blow through a bubble wand. Instead, see if they can make bubbles themselves by running the wand through the air. Transfer the fun to the bathtub for a bubble bath, and see if they can blow the bubbles onto the tile to pop them as they land. Host a little regatta with household finds. Materials: Various plastic tubs, corks, sponges, construction paper scraps, straws, etc. A tub, sink or bathtub filled with water. What to Do: Construct little boats out of yogurt tubs, plastic lids or sponges cut into shapes. Add extra details like sails and masts by taping paper to straws and inserting them into a notch in the sponge or taping them to a tub. Which ones float the best? Hint: Pipe cleaners twist into great little passengers who won’t weigh down your vessels. Variation: Host a race. Line up a variety of boats at one end of your tub, then blow on the sails to see which one makes it across the finish line first. Consider adding a few drops of blue food coloring to your water. Experiment with how much weight you can add to a vessel before it sinks. Materials: Sidewalk chalk, small rock and masking tape. What to Do: Mark out a hopscotch grid on a sidewalk or driveway. Write out H-O-P-E, placing one letter in each square. Toss the rock gently onto the grid and hop through the squares, naming the letters as you land on them. Hint: Have no sidewalk or it’s too chilly to go outside? No problem. Move the fun indoors. Mark out a grid inside with masking tape – it will peel right off the floor when it’s time to clean up. Variation: Practice hopping with both feet or just on one. Change out the letters to spell your child’s name or use numbers and practice counting. Go on a bird-watch to discover these early signs of spring. Materials: Binoculars, sketchbook, colored pencils or crayons, an eye for detail. What to Do: Go on a nature walk and see how many birds you can spot. Sketch your own version of the birds you see and display them at home as a reminder of spring. Hint: If you don’t find many birds during your walk, spread some birdseed in a small dish outside your house. Curl up by a window and watch who comes to enjoy the seed. Variation: Check out Emily Dickinson’s poem, “Hope is the Thing With Feathers.” Talk about how a pretty little bird singing on a branch might remind us of our hopes and wishes. 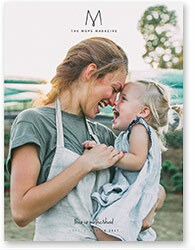 Tally Flint is a freelance writer and editor and the Children’s Nurture Coordinator at Denver Presbyterian Church. She makes her home in Denver, Colorado, where she and her husband are vastly outnumbered by their four children, ages 12, 10, 8, and 8.